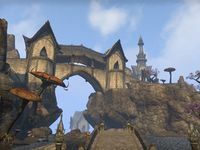 Originally an island in the Summerset archipelago, Eyevea disappeared from Tamriel thousands of years ago, spirited away by Sheogorath into his realm of the Shivering Isles. Eyevea is an island which becomes accessible after completing the Mages Guild quest line. It is a guild sanctuary containing all the services present in any town or city, and is also home to two special crafting sites, where you may craft items in the Eyes of Mara or Shalidor's Curse sets. 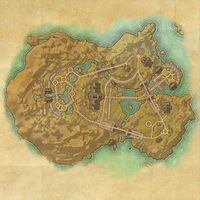 Upon completion of the related quests, the island becomes inhabited by numerous mages from virtually all corners of Tamriel. Many Adepts, Scholars and other Guild members can be seen all over the island, socializing, relaxing and also studying and practicing magic. Several dogs, cats and named pets reside on Eyevea, along with quite a few monkeys. The Arch-Mage's Boon: Accept Shalidor's gift of the Eidetic Memory. Eyevea Guild Hall is the heart of the island. The district starts near the water, at the bridge connecting it with the Wayshrine region. Fada and Vivien Dutil can be seen here, discussing recent events and their amazement with the island. At the bottom of the staircase a group of Orc mages, Azimbul gro-Shatur, Sgrula gra-Logdum and Gorsha gra-Bumolg, will share with you their excitement over an opportunity to freely practice magic. A prominent set of stairs starts here and leads up the hill to the guildhall itself. Outside the hall there are sitting areas, a well, several small shrines and staircases on both sides leading to the other parts of the island. Three Altmer mages, Murarel, Ceryolminwe, and Lanilian study and practice spell casting here. Valaste can be encountered just outside the guildhall, gathering her strength. Her presence here depends on the choices you made during the related quest. Inside the guildhall there is a lecture chamber, a resting area and portals to the Guild Vault, Merchant District and Traveler Falls districts. The Wayshrine is located on a small peninsula in the eastern part of the island. At the bridge, leading from the Guild Hall district, Farro can be seen, practicing ice magic. Opposite him, a group of three Nord mages, Knutrida, Gjarmal and Alfarmuth, can be encountered accompanied by a pet bear, Smarbjorn. Further towards the Wayshrine there is a small dock under the bridge. 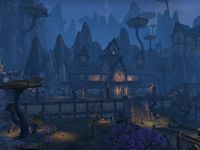 The dock is occupied by the merchant shop, Quality Auridon Imports, run by Karnellas. Near the Wayshrine itself yet more Adepts and Scholars can be encountered, relaxing and experimenting. There is also a group of Redguard mages here, Alkar, Delkash, and Helazh. Eyevea — Located on a peninsula on the eastern side of Eyevea. The Guild Vault district occupies the northeastern part of Eyevea. The Guild Vault and Baggery building, guarded by Vault Guardians, houses two bankers and a pack merchant. A portal near the bank can be used to get to the guildhall. Three Breton mages, Emmandic Oltz, Verney Begnaud and Yolande Hoger, spend their time here. Up the stairs, to the west from the bank, there is a rotunda popular among some of the residents. Mages gather here for songs, drinks and conversations. Outside the rotunda, a group of Dunmer mages, Bralos Drothro, Drissa Gilenim and Navanu Andules, can be seen experimenting with levitation. Bulpy, a pet guar, keeps them company. Merchant District is situated on a large peninsula which constitutes the southeastern part of the island. It can be reached either from the Guild Vault region via the southern bridge or from Traveler Falls via the eastern bridge. The district is a trading place where most of the Eyevea's vendors set up their shops and stalls. Between two bridges a portal to the guildhall can be found. Near the portal three Khajiit mages, Bizahad, Jalamya and Fedura, work on a research project. A pet Senche-Tiger, Zurguri, rests on the ground near them. Near the Chironasium an ambitious Orc mage, Glath gra-Bol, constantly summons daedric creatures. You can overhear her expressing her amazement. Apparently, Eyevea overflows with daedric energy, thus conjuration rituals here are quite effortless. This is probably the reason of a peculiar sight: a daedroth followed by a banekin, both non-hostile, running in and out of the market. 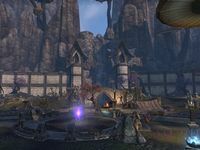 The crafting site for the Shalidor's Curse set can be reached from the Guild Hall district via the stairs leading down the hill towards the sea. The workshop is located on the southern side of Eyevea. This is a secluded part of the island, hidden away from its busier districts. This district occupies the western side of Eyevea. The Traveler Falls region contains five portals to the main city in each of your Alliance zones. There is also a portal to the Eyevea Guild Hall. Quite a few mages study and experiment with the portal magic here. The crafting site for the Eyes of Mara set is situated near the waterfall in the central part of the district. 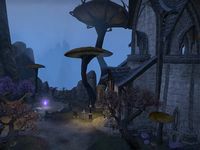 Near the crafting site, on a small bridge, a group of three Bosmer mages, Brengor, Dorinlas and Uunniel, can be encountered. Zessura runs her enchanting stall in the northern part, near the bridge leading to the Guild Vault area. ^aAppears only during the Mad God's Bargain and the Arch-Mage's Boon quests. ^bAppears at this location during the Mad God's Bargain quest. ^cPresence at this location after the Mad God's Bargain completion depends on the choices you make during it. The wayshrine only appears on the world map while you're in Eyevea. This page was last modified on 18 March 2017, at 17:11.